“CELAC” redirects here. For other uses, see Celac. The Community of Latin American and Caribbean States (Spanish: Comunidad de Estados Latinoamericanos y Caribeños, CELAC; Portuguese: Comunidade de Estados Latino-Americanos e Caribenhos; French: Communauté des États latino-américains et caribéens; Dutch: Gemeenschap van Latijns-Amerikaanse en Caraïbische Staten) is a regional bloc of Latin American and Caribbean states thought out on February 23, 2010, at the Rio Group–Caribbean Community Unity Summit, and created on December 3, 2011, in Caracas, Venezuela, with the signature of The Declaration of Caracas. It consists of 33 sovereign countries in the Americas representing roughly 600 million people. Due to the focus of the organization on Latin American and Caribbean countries, other countries and territories in the Americas, Canada and the United States, as well as the overseas territories in the Americas of France (Overseas departments and territories of France), the Netherlands (Dutch Caribbean), Denmark (Greenland) and the United Kingdom (British Overseas Territories) are not included. CELAC is an example of a decade-long push for deeper integration within Latin America. CELAC was created to deepen Latin American integration and by some to reduce the significant influence of the United States on the politics and economics of Latin America. It is seen as an alternative to the Organization of American States (OAS), the regional body that was founded by United States and 21 other Latin American nations originally as a countermeasure to potential Soviet influence in the region. 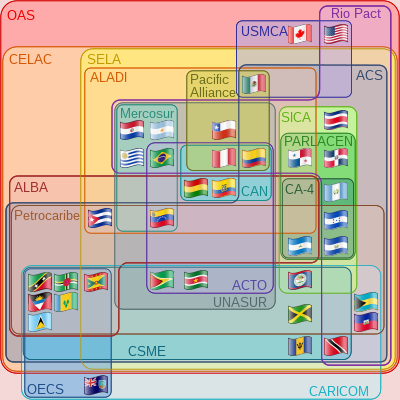 Exclusive Economic Zones of the member states of the CELAC. Considering them, the total area of the CELAC reaches 39,436,573 km². On February 23, 2010, Latin American leaders at the 23rd Rio Group summit in Playa del Carmen, Quintana Roo, Mexico, said they were forming an organisation of the Latin American and Caribbean states. Once its charter was developed, the group was formally established in July 2011, at a summit in Caracas. The bloc will be the main forum for political dialogue for the area, without the United States or Canada. As the first summit was underway in December 2011 United States President Barack Obama’s senior adviser on Latin America, Daniel Restrepo, informed reporters from Miami that the U.S. government would “watch and see what direction CELAC takes”. CELAC’s inaugural summit was due to be held in mid-2011, but was postponed because of the ill-health of Hugo Chávez, president of the host nation, Venezuela. The summit was instead held on December 2 and 3, 2011 in Caracas. It primarily focused on the global economic crisis and its effects on the region. Several leaders, including presidents Cristina Fernández de Kirchner, Dilma Rousseff and Juan Manuel Santos, encouraged an increase in regional trade, economic development, and further economic cooperation among members in order to defend their growing economies. Chavez, and other leaders such as Rafael Correa and Daniel Ortega, expressed hope that the bloc would work to further Latin American integration, end U.S. hegemony and consolidate control over regional affairs. Chavez, citing the Monroe Doctrine as the original confirmation of U.S. interference in the region, openly called for CELAC to replace the OAS: “As the years go by, CELAC is going to leave behind the old and worn-out OAS.” Correa called for a new human rights commission to replace the Inter-American Commission on Human Rights. Other leaders argued that the organisation should be used as a tool to resolve regional disagreements and uphold democratic values, but not as a replacement of the OAS. Santos stated that he would like to see dialogue within the group over whether existing counter-drug regulations should be revised. The president of the Latin American Parliament (Parlatino) said he expects that Parlatino will become the main legislative institution of CELAC. Amongst the key issues on the agenda were the creation of a “new financial architecture,” sanction for maintaining the legal status of coca in Bolivia and the rejection of the Cuban embargo by the U.S.
During the summit, the region was declared a “peace zone”. After three days and with the approval of participating representatives, a document with 83 focus points was created. It emphasized that, despite cultural and regional differences, unity between the participating countries is necessary in order to create progress. “Unity and the integration of our region must be gradually constructed, with flexibility, with respect to differences, diversity, and the sovereign right of each of our countries to choose our own forms of political and economic organization” stated the document. It also states which countries have been developing the best and how they are doing it in order for them to be a model for other countries. The issue of poverty was widely discussed. Cuba’s Raul Castro pointing out that throughout Latin America and the Caribbean, people want a fairer distribution of wealth, access to affordable education, employment, better salaries, and the eradication of illiteracy. He argued that CELAC countries can work together, support each other, to create new plans and solutions for these problems. Countries discussed plans to eradicate hunger by 2025. Venezuela would host a follow up meeting in late 2015 to review the United Nations Food and Agricultural Organizations plan for their region. They called for the U.S to stop meddling in regional affairs, for Puerto Rico to be able to participate in future summits, and for the embargo against Cuba to be lifted. Statements in support of Cuba and Venezuela were widely heard. CELAC rejected U.S. sanctions against Venezuela. It was decided that a monument would be built in memory of victims of the slave trade. Member countries also supported Argentina’s right to the Falkland Islands and peace negotiations in Colombia. a CELAC total used for indicators 1 through 3; CELAC weighted average used for indicator 4; CELAC unweighted average used for indicators 5 through 13.
b Data from CIA World Factbook for 2014.
c Data refer to 2014. Note: The colors indicate the country’s global position in the respective indicator. For example, a green cell indicates that the country is ranked in the upper 25% of the list (including all countries with available data). Sanders, Ronald (February 28, 2010). “To OAS or not to OAS: that is the question”. Jamaica Observer. Retrieved March 4, 2010. Singh, Rickey (February 28, 2010). “Decline of OAS in New Caricom/LA ‘Community‘“. Jamaica Observer. Retrieved March 4, 2010. “Latin America Has Excluded the U.S. … So What Now?”. La Razón. Bolivia: via translation from WorldMeets.US. February 26, 2010. Retrieved March 4, 2010. ^ El Salvador recibe presidencia pro tempore de la CELAC teleSUR. January 25, 2017. Retrieved January 26, 2017. ^ a b c d e “World Development Indicators”. World Bank. July 9, 2012. Retrieved 2012-07-11. ^ “‘'Mexidata’' (English) March 1, 2010″. Mexidata.info. Archived from the original on April 26, 2012. Retrieved May 25, 2012. ^ Acuerdan crear Comunidad de Estados Latinoamericanos y Caribeños[permanent dead link], Associated Press, February 23, 2010. ^ América Latina crea una OEA sin Estados Unidos, El País, February 23, 2010. ^ “L. American leaders officially sign CELAC into effect as new bloc”. news.xinhuanet.com. December 4, 2011. Retrieved 2013-01-28. ^ Gooding, Kerri. “IVCC encouraging bilingualism and cultural integration”. The Barbados Advocate. Advocate Co. Archived from the original on May 12, 2012. Retrieved December 26, 2011. However, at present much of the integration occurs at the governmental, political and policy level as opposed to the personal, individual level, hence Tutor Jamal Henry added his voice to the plea by the Ambassador to have more persons embracing the culture and learning Spanish. CELAC comprises 33 nations making up an estimated population of 600 million people with five official languages. United and integrated the countries of CELAC can be powerful, “together [the 33 nations of CELAC] are the number one food exporter on the planet,” further commented Ambassador Febres. ^ a b “Mexico gives birth to the Community of Latinamerican and Caribbean States – MercoPress”. En.mercopress.com. Retrieved 2016-05-05. ^ “uake Overshadows Clinton Tour of Region”. The New York Times. Retrieved 2016-05-05. ^ a b “_ Nuestro Norte es el SUR”. Telesurtv.net. Archived from the original on June 12, 2010. Retrieved May 25, 2012. ^ “Indymedia Lëtzebuerg – Onoofhängege Journalistekollektiv”. Indymedia-letzebuerg.net. March 20, 2016. Archived from the original on August 24, 2011. Retrieved May 5, 2016. ^ “Cancilleres del Grupo de Río avanzaron en idea de crear nueva instancia regional”. granma.cu. Archived from the original on February 19, 2012. Retrieved May 25, 2012. ^ a b In Latin America, Rhetoric Triumphs Over Reality Estadao, Brazil, via translation by WorldMeets.US (English) February 25, 2010. ^ a b c d e Rueda, Jorge; James, Ian; Toothaker, Christopher (December 3, 2011). “Leaders at Americas talks: world economy top worry”. Seattle pi. Hearst Communications Inc. Associated Press. ^ a b c d “Venezuela hosts first CELAC summit”. PressTV. December 3, 2011. ^ Christopher Toothaker (December 2, 2011). “CELAC, Community of Latin American And Caribbean States, New Organization Aims To Strengthen Regional Integration”. Huffingtonpost.com. Retrieved 2013-10-25. ^ “CELAC-EU summit opens in Chile – Business News”. SINA English. Retrieved 2013-10-25. ^ “Dilma viaja a Cuba para segunda Cúpula da Celac e inaugurar Muriel – Notícias – R7 Internacional”. Noticias.r7.com. August 23, 2012. Retrieved 2016-05-05. ^ “Equipos técnicos preparan los primeros documentos para Cumbre de la CELAC”. Retrieved 2015-01-25. ^ En 3 claves: Lo que debes saber de la IV Cumbre de la CELAC teleSUR. January 24, 2016. Retrieved January 27, 2016. ^ “Compromiso de hermanos” reúne a mandatarios de Celac en Ecuador ANDES. January 27, 2016. Retrieved January 27, 2016. ^ V Cumbre CELAC teleSUR. January 23, 2017. Retrieved January 24, 2017. ^ Comienza hoy en República Dominicana la V Cumbre de la CELAC teleSUR. January 24, 2017. Retrieved January 24, 2017. ^ “ESO exhibition area at the CELAC–EU summit in Santiago”. ESO Press Release. Retrieved February 12, 2013. ^ “Latin American summit re-run to test Chavez health”. Reuters. November 30, 2011. Retrieved December 2, 2011. ^ “Parlatino Interested in Being CELAC Legislative Organization”. Prensa Latina. December 2, 2011. ^ “Obama in Cartagena: No change, dwindling hope – Opinion”. Al Jazeera English. Retrieved 2012-05-25. ^ “Conclusiones de la Cumbre de la CELAC 2014 en Cuba : AGRO Noticias”. Fao.org. Retrieved 2016-03-08. ^ “5 Things That Happened at the CELAC Summit in Costa Rica”. Telesurtv.net. Retrieved 2016-03-08. ^ “World Development Indicators”. World Bank. March 23, 2017. ^ “Human Development Report 2016” (PDF). United Nations Development Programme. 2017-03-21. ^ “Fragile States Index 2016”. The Fund for Peace. June 28, 2016. Archived from the original on February 4, 2017. Retrieved September 14, 2016. ^ “Rule of Law Index 2016”. World Justice Project. 2016-10-20. ^ “Corruption Perceptions Index 2016”. Transparency International. 2017-01-25. ^ “Country Rankings: World & Global Economy Rankings on Economic Freedom”. Heritage Foundation. 2017-02-15. ^ “Global Peace Index 2016”. Vision of Humanity. 2016-06-08. ^ “2016 World Press Freedom Index”. Reporters Without Borders. 2016-04-20. ^ “Democracy Index 2016” (PDF). Economist Intelligence Unit. 2017-01-25.